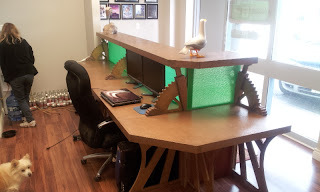 There has been no awesomeness at Oxenham design since the desk finished! 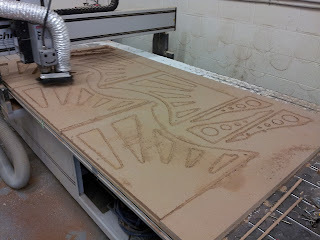 We've been cutting the paint stencils for the township on our Techno cnc. 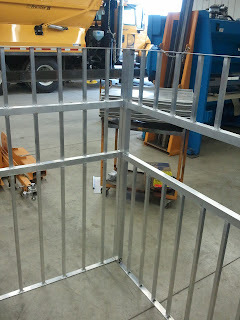 We are able to cut ten of these .080" at a time. The current bike lane stencils actually consist of 3 pcs each. Thats a lot of cardboard! 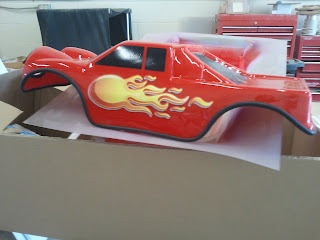 We just got another order for 200 chevron stencils for the highways as well. However, today the lack of awesomeness changed! Woo-hoo! At around noon, a giant crate showed up to the loading door. I knew it was coming, but it was still pretty awesome! 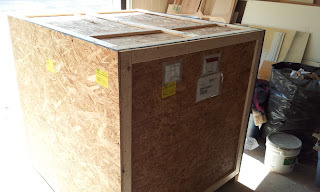 This crate was pretty huge, at around 4' cubed, it was a monster. Are you still wondering??????? 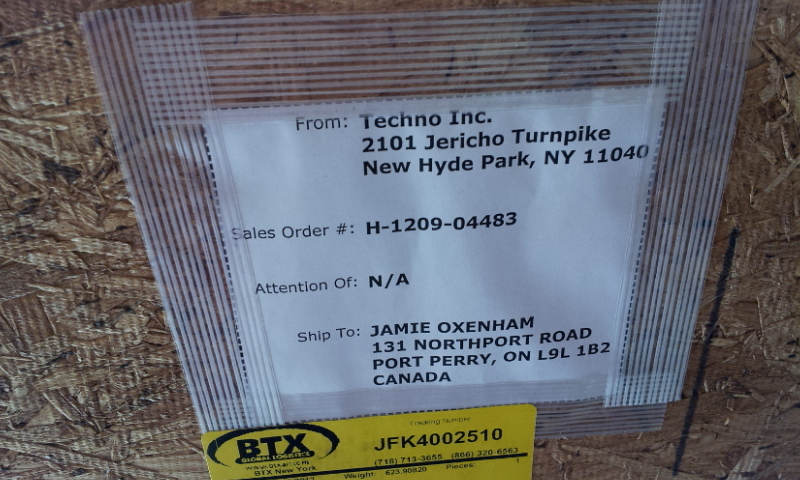 After our trip to New York to visit Techno cnc, 2101 Jericho Turnpike is my new favorite geographical location. 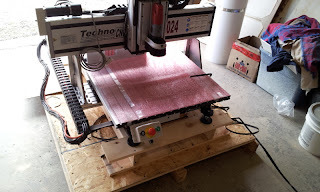 It's our new addition to the family, a Techno cnc LC 3024 tabletop machine! YAAAAAAAAAAAAY! The packing was amazing, I don't think anything shifted, even a millimeter. This is going to be amazing for us. 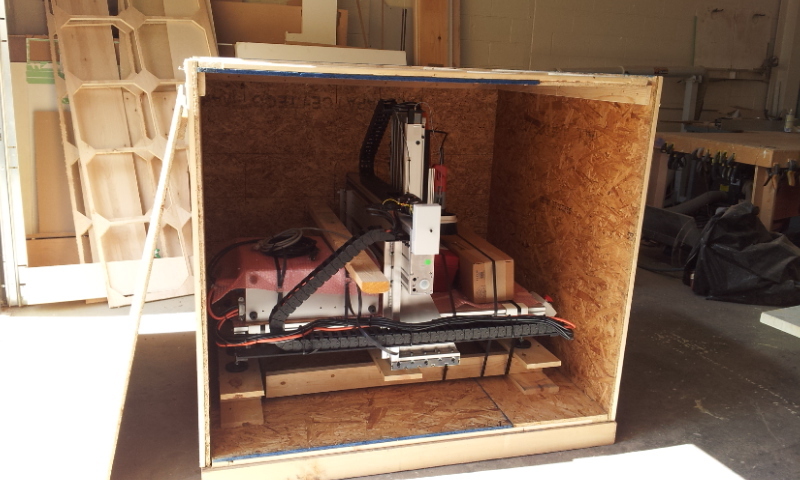 It will be so awesome to be able to run 2 machines now with the accuracy that we need, at the speeds we need. 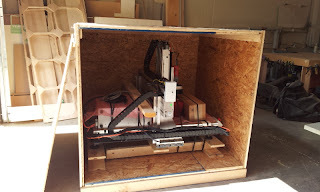 Our plan is to be able to physically show people, when we teach our techniques at various seminars, how user friendly, accurate and rigid these Techno machines really are. 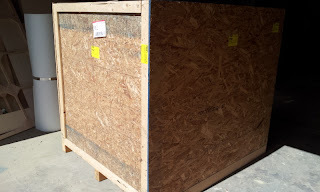 After looking the machine over for any damage that can occur when shipping something of this size and weight, it becomes even more apparent how well these machines are constructed. 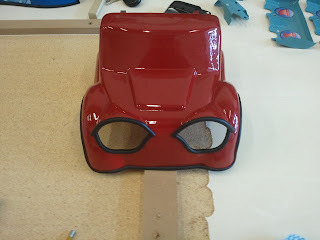 Not only are the materials top notch, the overall fit and finish leaves the competition in the dust! 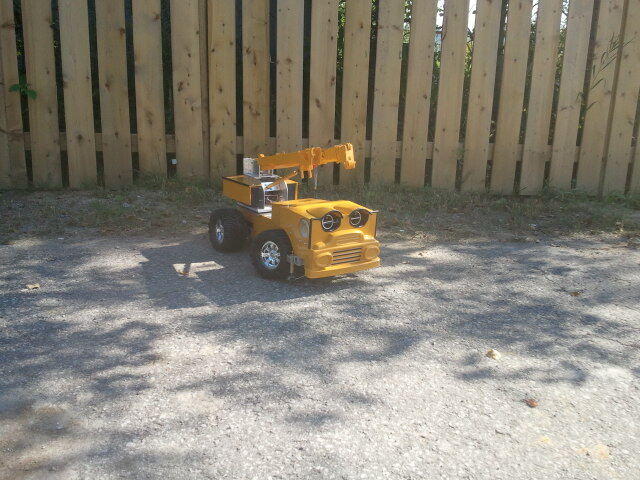 This thing is tank. 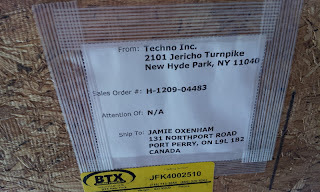 We had a delivery to make this afternoon, so I wasn't able to get it set up at all. But while we were out on the delivery, I picked up a heavy duty steel table with locking castors, so I will be able to move it around depending on the jobs were running. I'm in cnc router heaven for a second time this year. 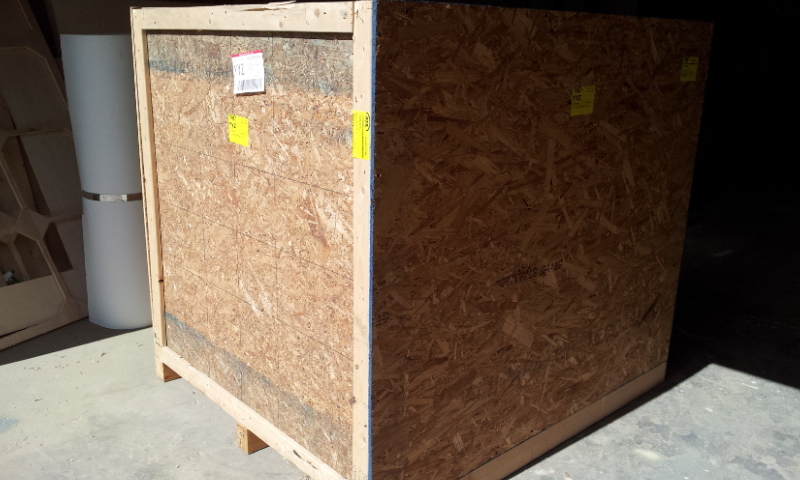 I want to thank everyone who helped handle all the shipping, freight and duties to bring this into the country. 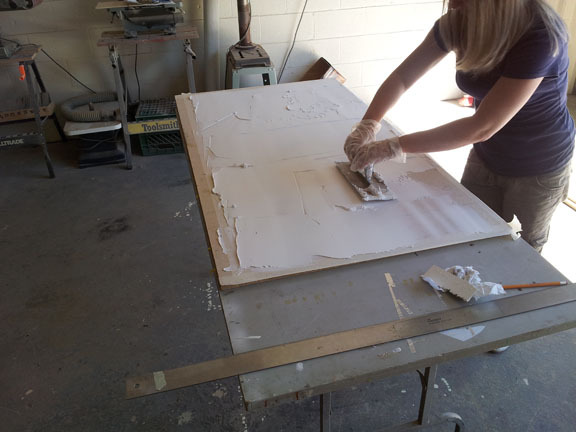 Bobbi Morison and Crista Nielson at Hitek Logistic Inc.
We've been cutting the bike lane stencils for the township, as well as working slowly on the desk. I've also been in the process of transferring all of my files to a new PC. This has been a little slow for me. I decided to move into 2013 with a new laptop running win7. I know, I know. I was using xp right up until now. Rock solid it was, and as 90% of my software is stuck in the 32 bit lifestyle, there wasn't much point in jumping on 7. However, I did want to take advantage of multithreading, plus the new machine has 3 gb of dedicated video ram! so now was the time. 7 still feels weird to me, but I'll survive! We've been doing the final bits and pieces on the desk when there's time here and there. I guess I'll have to get rid of the leftover Coor's cans. They look a little um......alcoholic-ish! 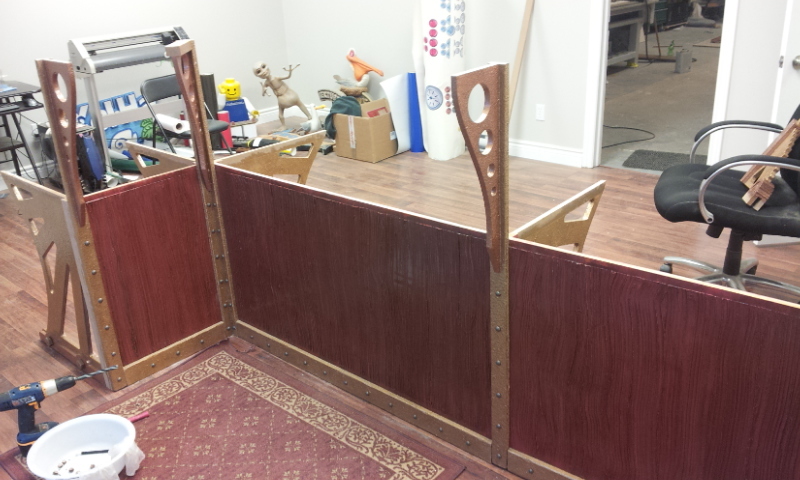 Now the desk is done, I've started some of the single shelves for the walls. Who knows when they'll be finished, soon I hope. An associate stopped by and remarked about the desk: "Must be nice to have all this free time to build a big desk" I had to laugh a little! 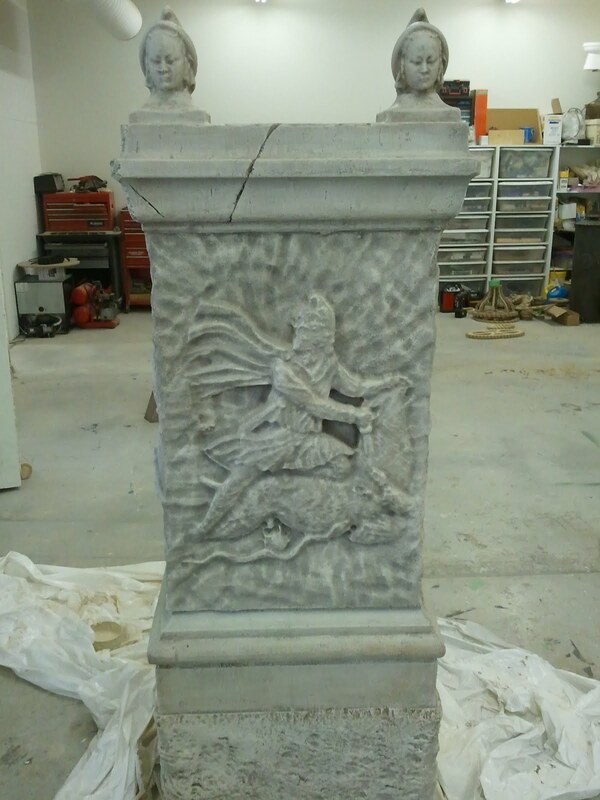 Last year sometime, if you remember, we did an ancient stone sculpture of the God Mythra. If you do a blog search for mythraic stone in the search bar, you should get to the build. I happened to find the trailer for the film on Twitch film.com. YAAY! We do a lot of stuff for Westside Studio in the city. They're a huge commercial photography house. I've featured a lot of projects that were for them. Usually I spend a bit of time once a month creeping their blog for projects we have been involved in. I love the fact that they also have a 'behind the scenes' thing happening over there. Alot of the times, I don't even recognize our stuff right off the bat. 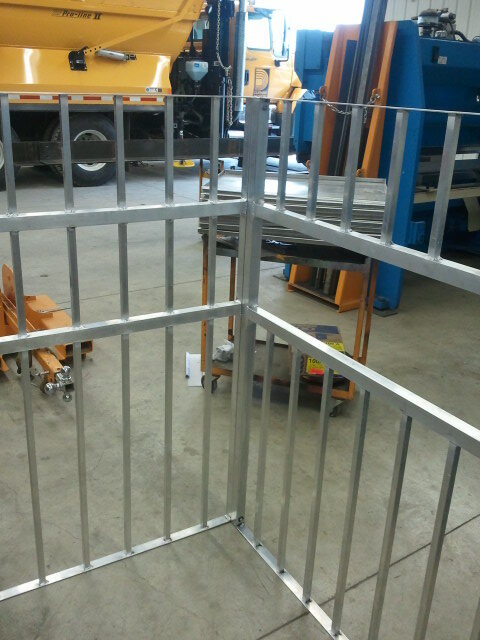 In October of last year, I posted about an aluminum shark cage they asked us to fabricate. As I was looking through their posts, I found the write up about it. 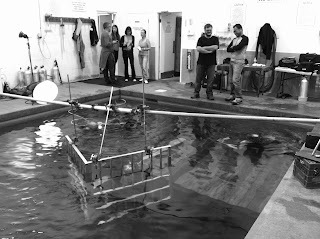 Heres the cage submerged in the pool they were shooting in. 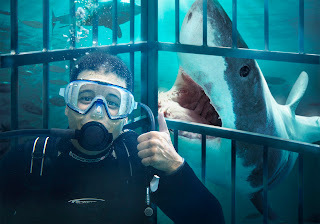 This was the final shot, comped with the sharks. And this is the final print for the new Freedom 55 campaign. 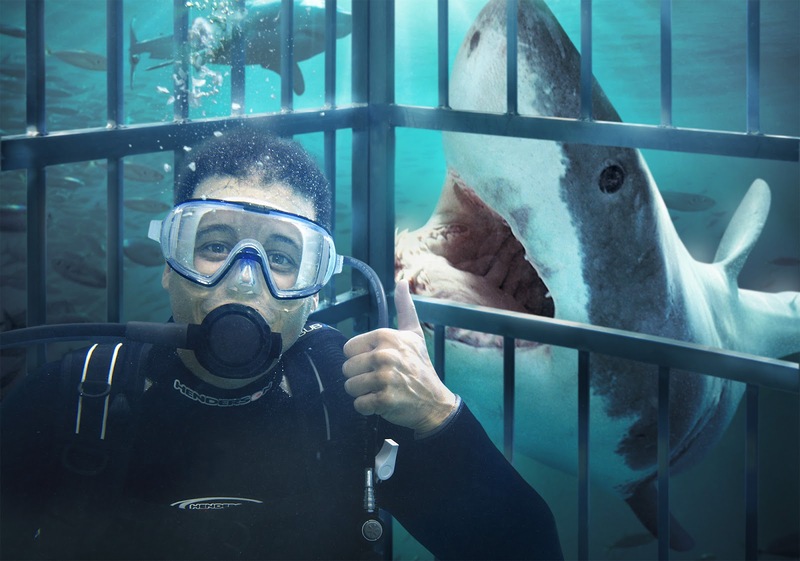 Agency: bright red communications inc.
George's work is always outstanding, and we love doing props for him. I decided to not work this weekend! Although Sunday I kinda wanted to get back to the desk. 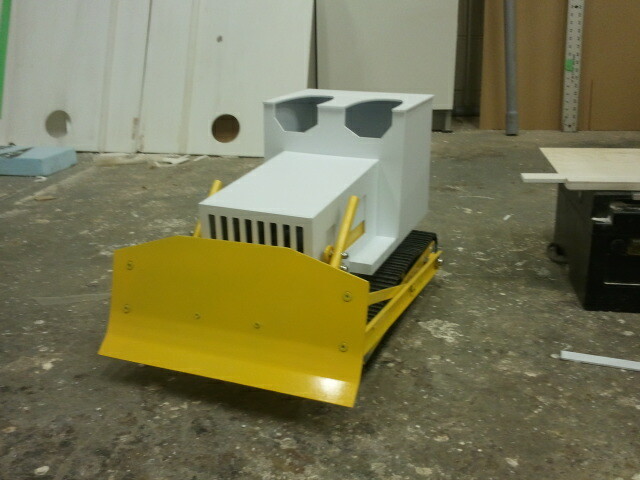 Unfinished projects eat away at me. Plus the desk is fairly large, and it's taking up an awful lot of space to not be used. On Monday, I decided that instead of buying more acrylic for the front of the desk, I'd use the sizable chunks of 1/2" that was left over from the Molson bars that we built in the summer. 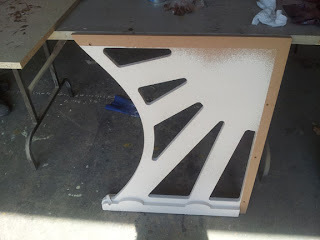 1/2" is WAY overkill for the desk, but it was here, and It was within an inch of what I needed on the large piece. Of course, it wasn't textured, but Aspire would soon fix that little problem! I drew up the file in PS for export as a greyscale into Aspire. I just used a spatter brush and saved it out as a 16 bit greyscale. I used a 1/2" ball nose cutter with an 8% step-over. I set the relief to .125" deep. 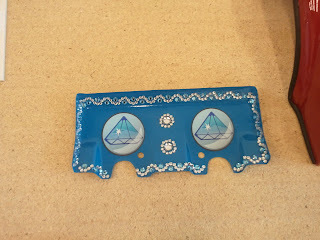 As this is 1/2" acrylic, I certainly had the thickness. The hopes is that after I spray it with a scary green colour, I can edge light it so it glows green at night through the office window. Not a big deal in the summer, but in the winter it gets dark at 4 pm, so people will still be out and about. 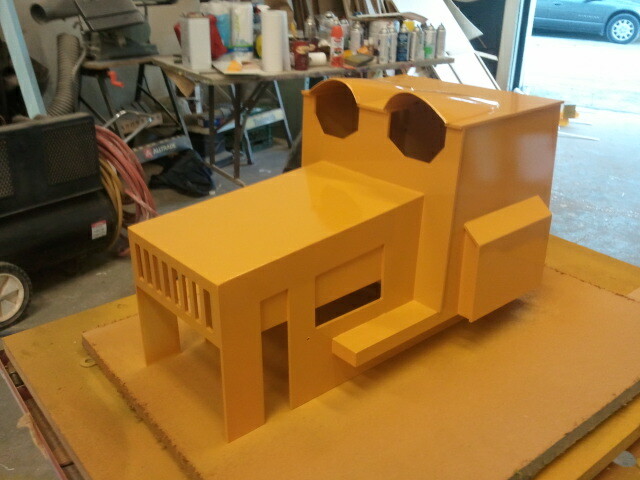 The painted details are now done on the portions that we had assembled. 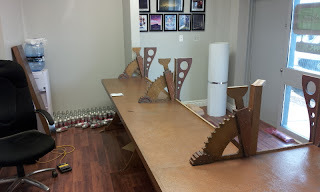 We're kind of building the desk, while working on a few other paying jobs, so It's not going super-fast. 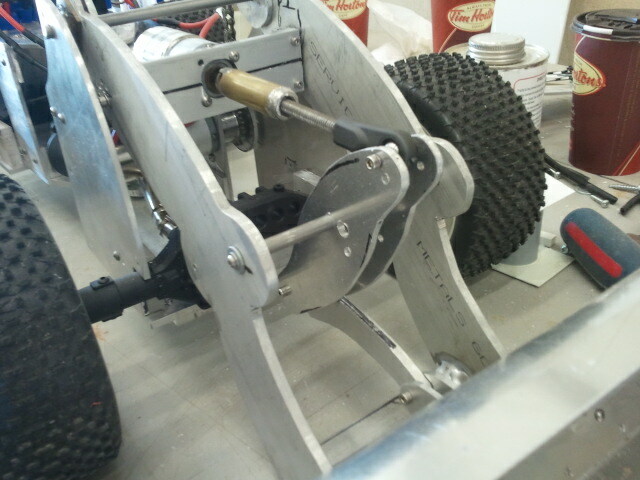 We also got the back supports installed to help solidify the upper counter strength. 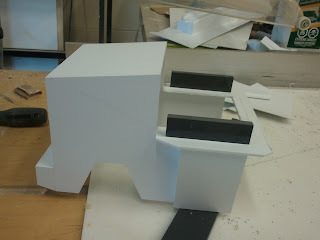 The textured acrylic will reside between these supports, from the lower counter to the underside of the upper counter. 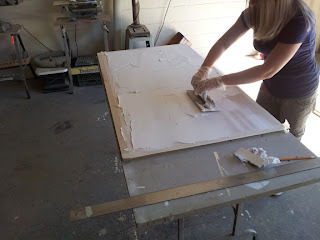 We have to deliver another order of road stencils to the township tomorrow, so that might make finishing the desk a little hard, but I'm keeping my fingers crossed! 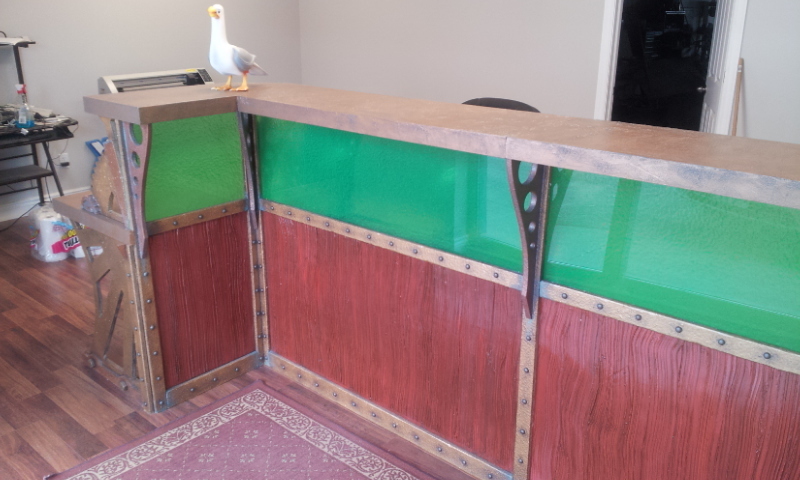 Our reception desk is coming along quickly now! 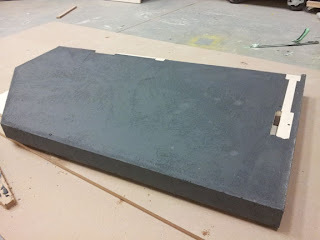 I got the actual desk surfaces fabricated and coated with our texture coating. We tinted the compound with some dark grey acrylic paint we had. This won't be the final colour, but if it get dinged up at all, it will just be dark, and not the white colour it usually is. There's a total of 5 counter sections, so we had to work fairly quickly before the compound set off. I also had to tape off the portion where the upper brackets mount, so the bracket heights would change, causing trouble mounting the upper counter portion. 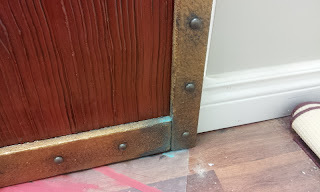 The rivet strips got all there base colours on, and so did the upper counter mounts. 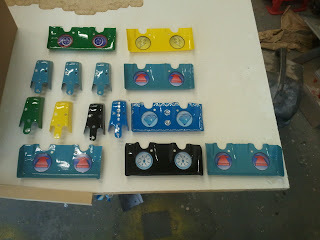 We did start to get the pieces all together, so far it's been a giant snap together project. The exception being the crazy uneven floor. But everything was made adjustable to allow for small variances. So far so good. I'm hoping to pick up the textured green acrylic tomorrow. 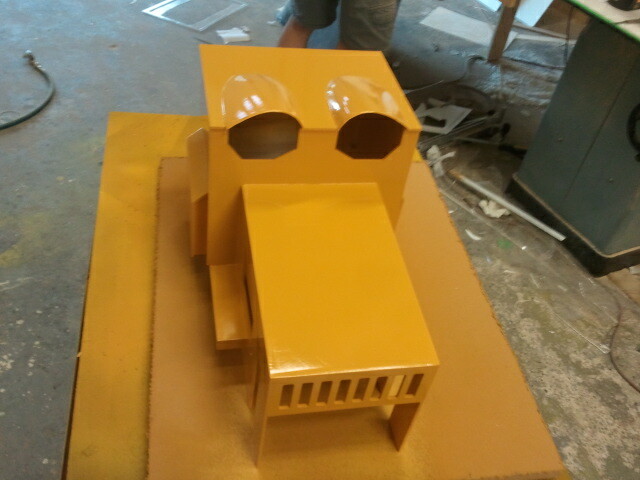 We're going to edge light the acrylic so it will glow a weird green colour at night. I'm hoping we have time to build the matching shelves for the wall before the next few projects come in. 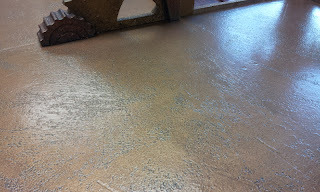 Tomorrow we'll get the silver on the counters and then it can dry all weekend! Finally a place to work! 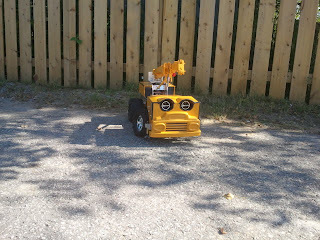 Now that the Turbo Town job has wrapped up, I wanted to keep the steam going. Maybe not the 18 hour a day steam we had, but some steam. We've got some ad campaign projects that are awaiting approval, so I'm using the short time available to build a new desk. 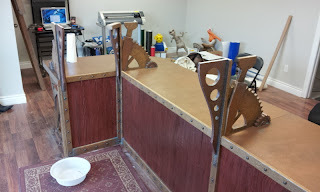 The desk will be more of a work station/ front desk for when people come into the shop. Since we moved into this space in May, I have been working from a VERY small desk in the corner of the office space. I have been using my laptop for the computer design stuff as the current desk isn't big enough for the desktop computer I'm dying to get back to using! 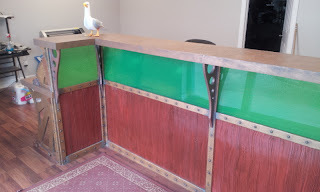 The whole theme for the desk area was pulled from our Institute sign we did with the mechanical fish on it. So the desk will be heavy brass/ copper and woods. In no way am I trying to fool anyone into thinking we're using the real thing, I think it's far more interesting to make it look like it isn't the real thing. Plus it's in keeping with dimensional signage and film props! This will be a fairly good size desk as it needs to house 2 20" monitors, a computer tower, my laptop and the vinyl cutter. 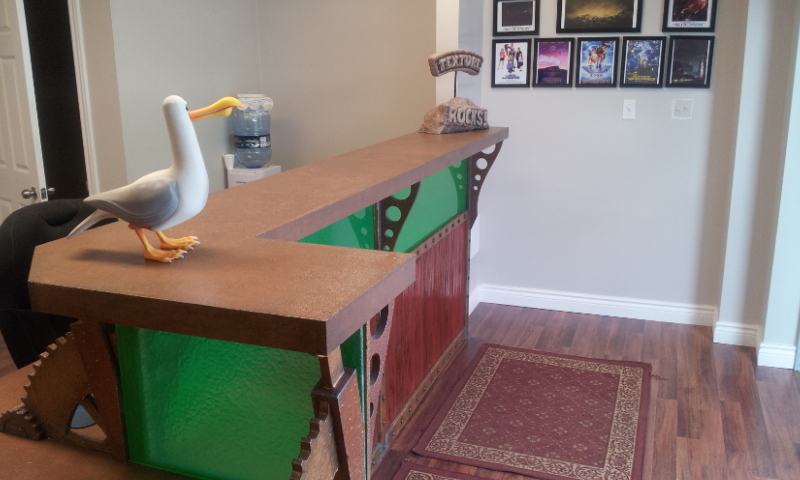 As well as having a place to serve customers that come in for the signage end of things. 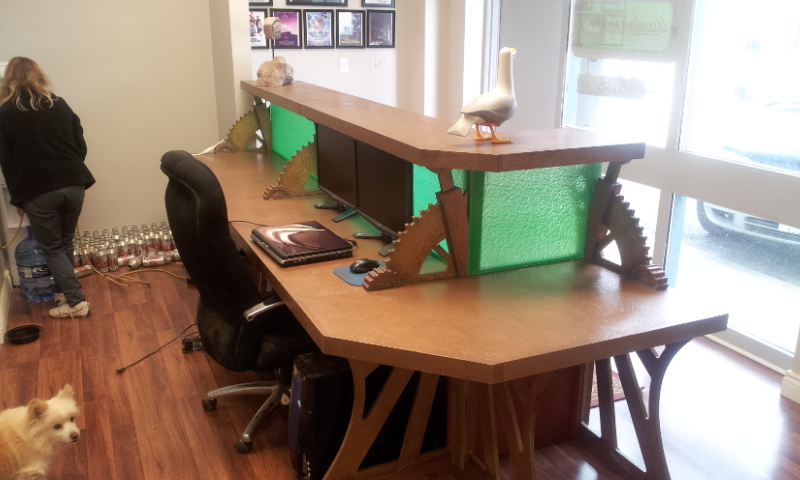 The desk was designed in Corel, with no colour renders or 3d models. 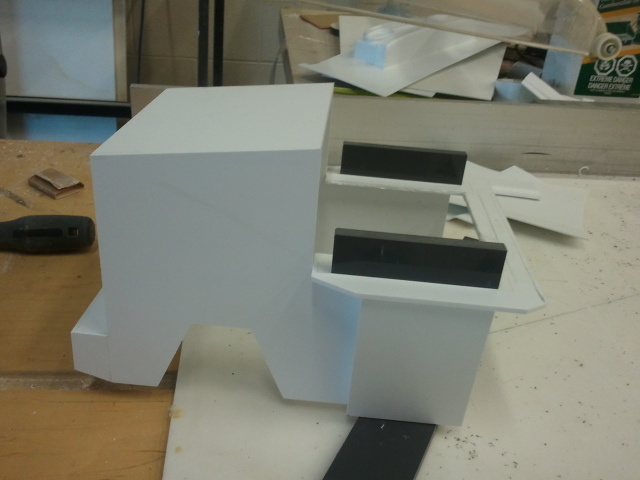 I know what I'm going for, so the need to model it is a waste for me to do, as I'm not needing any approvals. Just a front, top and side elevation. I exported the vectors from Corel into Aspire for toolpathing. Once again, Techno cnc produced the panels quickly and accurately. I love that I can do all the complicated stuff in the computer (at my miniature desk) and have accurate pieces I can assemble right away. 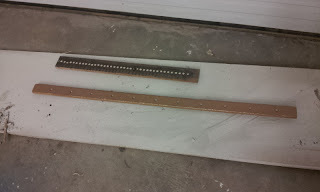 Of course, not everything was cut on our Techno, all the rivet strips, which will act as seam covers, were table saw pieces. 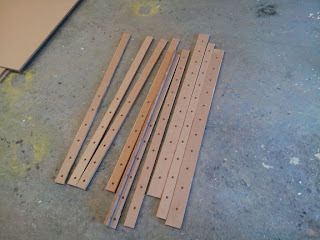 Jody got to work right away laying out and drilling the 1/2" holes. Were going to use wooden button screw covers as the rivet heads. With the front facing panels cut, Jody taped off the spots where the rivet strips will end up going. The next step was to parge the panel with acrylic tile adhesive. 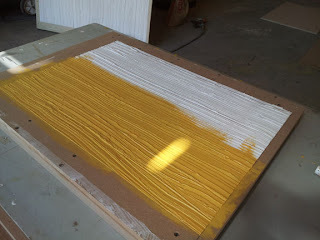 We've used this a bunch of times for texture. It works great for this sort of thing, and it's fairly inexpensive. Inexpensive materials seem to be far and few these days! We made a basic woodgraing tools from a chunk of pvc we had from the last job. It worked great. Once the adhesive had hardened up, we got a base coat of yellow ochre on the panels. 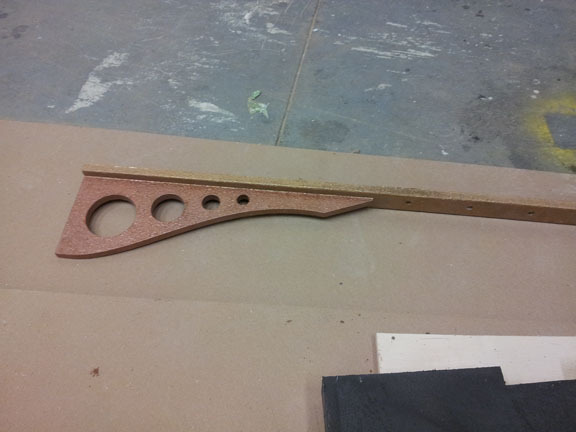 This will be the first of a few coats we'll use to achieve our simple woodgrain feel we want. 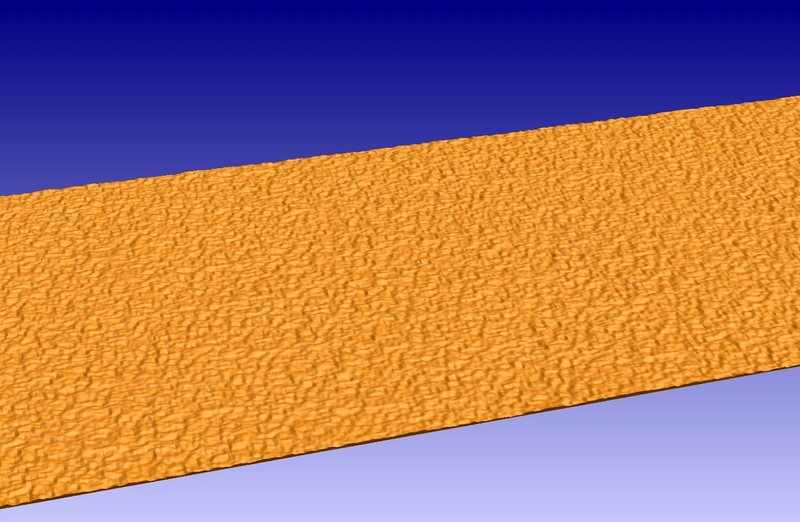 All the rest of the parts we texture sprayed with our scenic mud mixture. These will look killer in a bronze colour. We've also casted up some large bolt heads which will decorate the desk in spots. All in all, it looked pretty good. 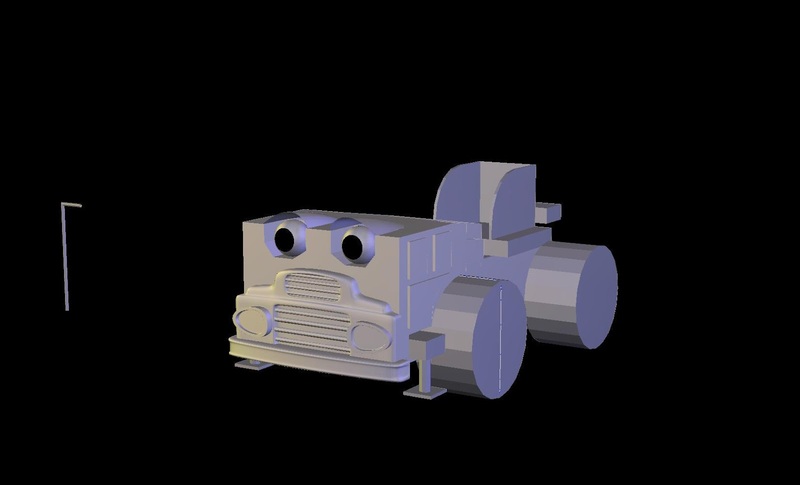 Hopefully we'll get to re-do the mold with the new face next season when there's more time! After a few revisions by the director, this was the character for Fill the front end loader. John whipped this up pretty quickly. He gave me the Illustrator files, which I sent to Aspire for toolpathing. I dumped a pile of parts on John's desk, and after a little while he had them all assembled into the character. Thankfully he knew where they all went, cause I had no clue! 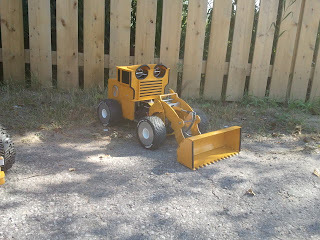 I took a ton of pics of the loaders mechanics before stripping it all down. I was worried that I might forget how things were assembled after the paint was dry. Good thing, cause I seemed to have forgotten right away! 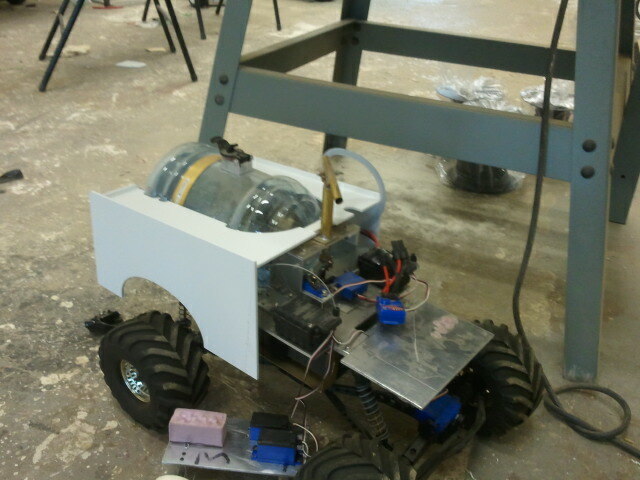 With the pics on my phone handy, the re-assembly was pretty straight forward. 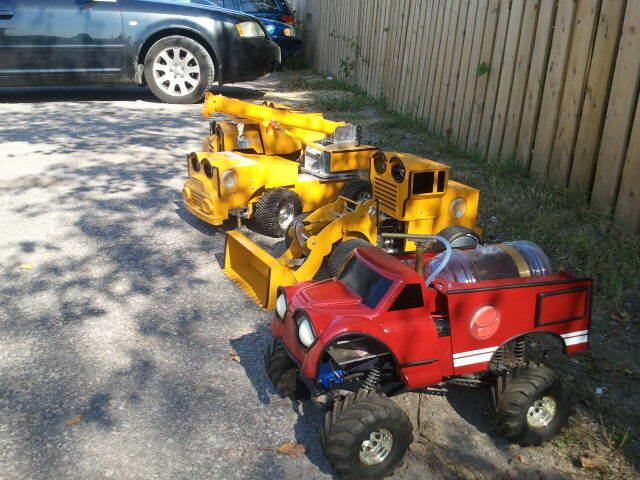 The last large vehicle was the fire truck. 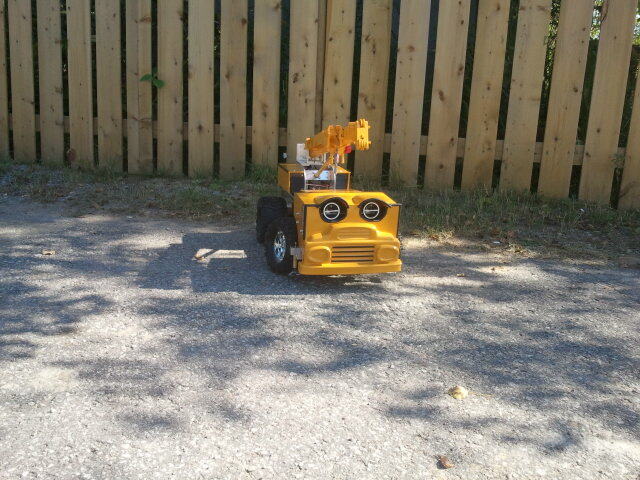 The body had been started when we got it, but the cleanup would have bankrupted us on time. It was faster to start from scratch, especially when our Techno cnc is cutting the parts! The rear portion in the picture was all cut from 1/8" styrene like the rest of the trucks. 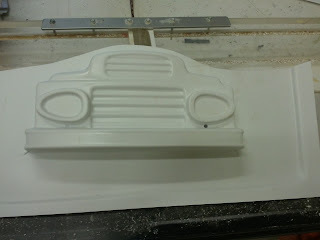 The front already had a mold that had been made, so we were able to get a couple of good pulls from 1/16" styrene. 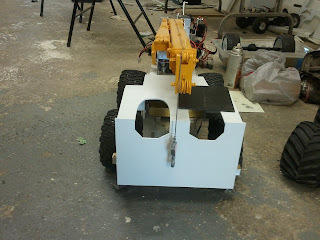 It didn't totally work with the back end of the truck, but we were able to succeed in getting a good meld of overall design for the time frame. Jody got all the racer fins painted and finished. Some of the colours were so transparent, she didn't think they'd ever cover, but she's pretty persistant! 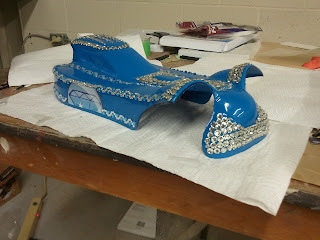 One of the racers is named Jewel, and as her name would imply, she's got a lot of bling! The description for her was a bedazzled car, over the top. I think Jody nailed it right on the head. This girls got b-b-bling! 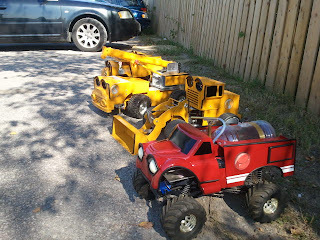 With Turbo town done, and the exception of a 2nd dumptruck head that came today, this tsunami is over! It was a ton of work, from all the houses, to the vehicles, I thought I'd never sleep. But as always, the deadline comes, and goes. So much of it is a blur, it's hard to remember the little details. Thankfully I own a camera, cause otherwise I wouldn't be able to recall very much in a month from now. 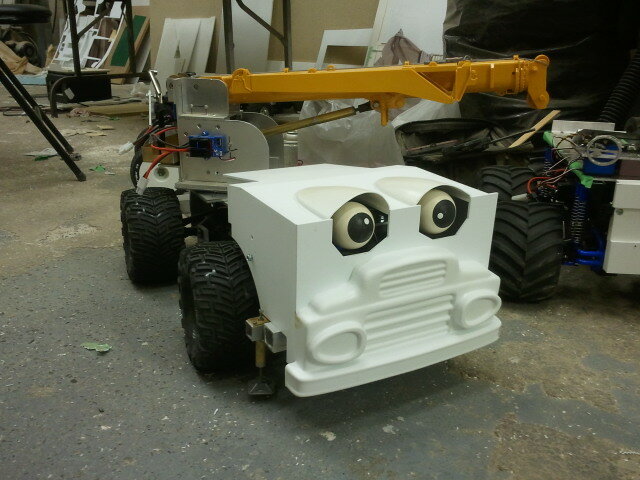 Although these trucks are one offs, it's starting to feel like all we do is make small vehicles! For the crane, production already had a mold made from MDF. It was a little strange looking for sure, kind of a cross between a walrus and a clown, and as un-symmetrical as you could get! 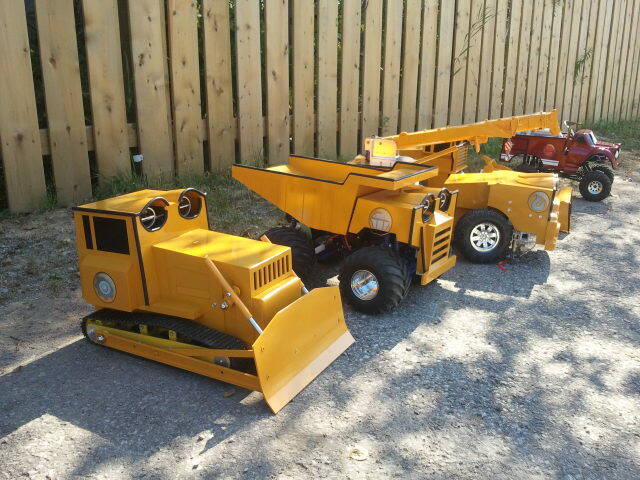 Totally not suited to the style of the trucks. The director wanted (needed) something different. Time is now drastically running out. We are at 18 hour days times 2 people, and 10 hours times one person. The time for last minute changes is GONE. I had started early on tackling the crane head, this is the only reason we were able to do something different than what they had supplied. 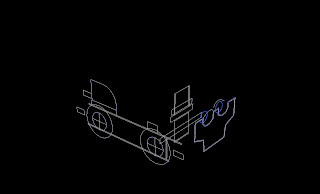 I measured up the crane chasis and drew the front and side dimensions in Corel draw, using the real world sizes and material thickness. 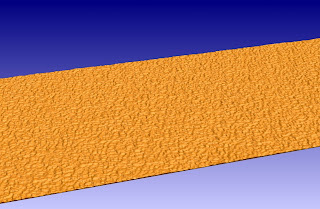 These vectors were exported out to Hexagon for 3d model massing. I wouldn't have bothered doing all this work for the crane, but the director wanted to see something dimensional in order to approve the design. The only full 3d part of the crane would be the grill portion, the rest is all 2d cut styrene panels, so from a fabricating point of view, I really only needed the finished grill portion. As we were standardizing all the construction vehicle eye shapes, I brought in the vectors from Dug the dumptruck as well. I'll use those vectors to mass the crane face for approval. After a little while, I had come up with this design, which was approved right away. 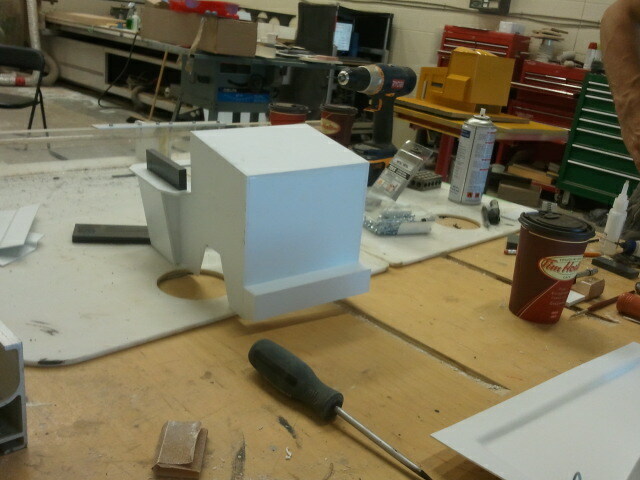 We vacuum formed the final part from 1/16" styrene. The only thing with using 15 lb HDU as a vac mold is that it compresses a very tiny bit under the force of the vacuum, then it expands tightly into the finished part, making it a bit difficult to remove. I wouldn't use HDU for a production run, but it holds up well in the end. 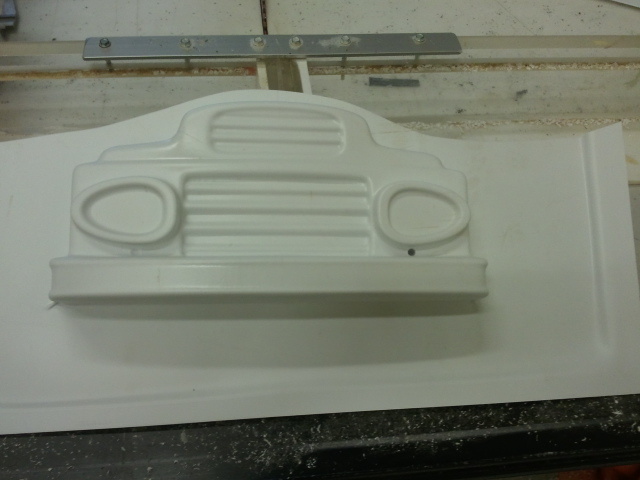 None of our HDU molds got damaged at all during the process. 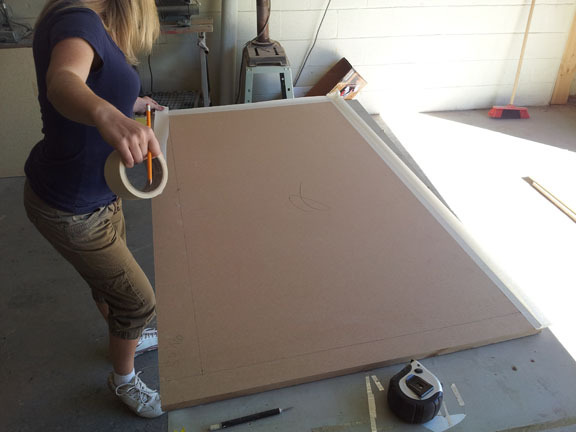 While the grill was machining away, I built up the 2d panels I cut before the 3d run, into the structure of the head. 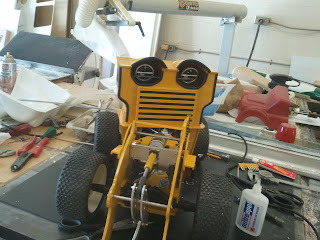 With the grill firmly attached and the eyebrow arches in place, this guys ready for his spanky new paint job. 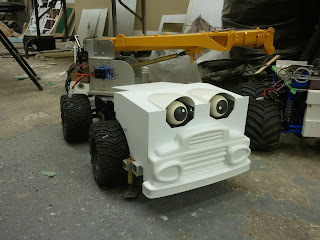 I wish I had the final eyes to go in for the final pics, instead of the animatronic eye rings, but the only 2 we have are being used to fit the mechanics on the other trucks at this point. 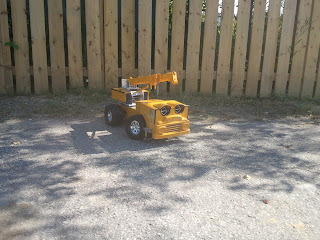 While the crane was being built, John was working on the bulldozer, Sandy. 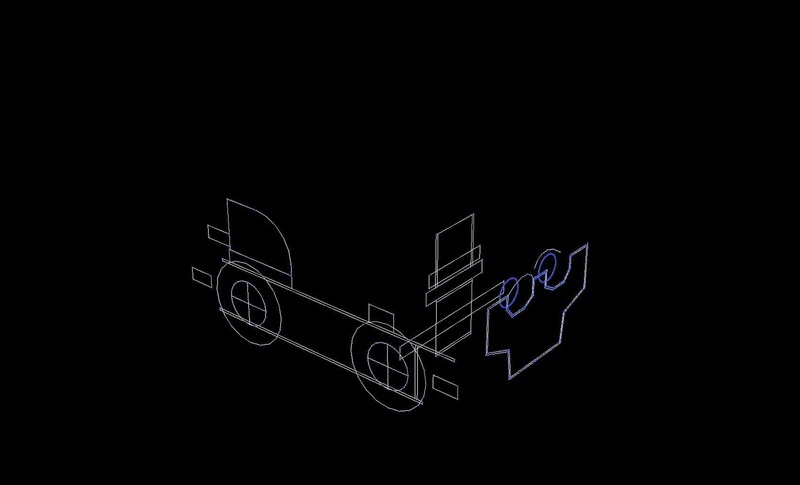 He drew this all up in Illustrator, and gave me the files for toolpathing in Aspire. With the model all finished, it was time for paint. 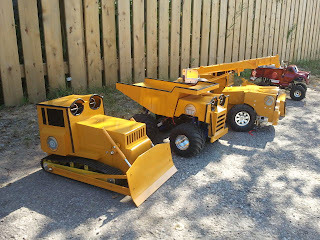 With the vinyl all applied, and the frame painted up, these are some nice looking trucks! just another week on the town.